High quality with attention to detail, the ANSI approved LWT attic ladder is made from quality pinewood assembled in three sections. The LWT attic ladder model is a super-thermo insulated unit recommended for projects that stress energy-saving due to heat loss. The LWT is equipped with a locking mechanism that is installed inside the insulated and sealed door panel. The length of the ladder may be adjusted within 1 inch after cutting the side rails to set the ladder evenly on the floor. Construction of attic ladder provides more steps (tread rise about 10 inches) to improve safety and comfort. A red, metal handrail is included and may be installed on either side of the ladder. Springs are located on door surface to make entry to attic wider and more comfortable (the widest entrance on market - compare to other products). Door is well balanced - it opens and closes easily (NO sudden movements). Fits rough opening 22 1/2 in. x 47 in. and ceiling heights 7 ft. 2 in. to 8 ft.11 in. Attic Ladder (Wooden insulated ) LWT 22 1/2X47 300 lbs 8 ft 11 in High quality with attention to detail, the ANSI approved LWT attic ladder is made from quality pinewood assembled in three sections. The LWT attic ladder model is a super-thermo insulated unit recommended for projects that stress energy-saving due to heat loss. The LWT is equipped with a locking mechanism that is installed inside the insulated and sealed door panel. The length of the ladder may be adjusted within 1 inch after cutting the side rails to set the ladder evenly on the floor. Construction of attic ladder provides more steps (tread rise about 10 inches) to improve safety and comfort. A red, metal handrail is included and may be installed on either side of the ladder. Springs are located on door surface to make entry to attic wider and more comfortable (the widest entrance on market - compare to other products). Door is well balanced - it opens and closes easily (NO sudden movements). Fits rough opening 22 1/2 in. x 47 in. and ceiling heights 7 ft. 2 in. to 8 ft.11 in. 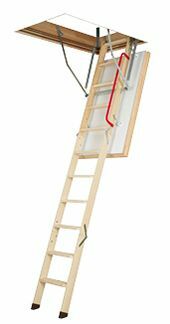 Attic Ladder (Wooden insulated ) LWT 22 1/2X47 300 lbs 8 ft 11 in is rated 3.6 out of 5 by 5. Rated 1 out of 5 by Annoyed from I ordered this attic ladder because of the space available in which to install it I needed a 47" ... I ordered this attic ladder because of the space available in which to install it I needed a 47" opening (as opposed to other companies standard 54" opening). Unfortunately the product was damaged when I opened the carton and removed the paper around the frame. The frame was split where the hinges fastened into it. I returned the product to Home Depot. I could not reorder the same product as it was out of stock with no expected restocking date. I ordered a version with less insulation instead since I was time constrained. Unfortunately when that unit was delivered, it also was found to be split where the hinges of the ladder attached to the frame. I am now waiting for the third unit to be delivered to Home Depot. While I am not at all pleased with the apparent quality control of Fakro, the Home Depot staff has been EXCELLENT in dealing with the situation. Rated 5 out of 5 by Horus from This item is an excellent purchase. Pricier than others... This item is an excellent purchase. Pricier than others but worth the money. Well built, easy to install and use. Instructions are easy to comprehend and makes the job easy. You won't be disappointed. Rated 3 out of 5 by Robert from The ladder is great. It arrived slightly damaged, but... The ladder is great. It arrived slightly damaged, but was repairable. Rated 4 out of 5 by JH1942 from great ladder; but improve instructions This is a great unit, fits in really well and not too difficult to install. Only problem is that for this particular model the paper instructions that came with it were not right. The online pdf on the Fakro web site was also not correct. The online video on the Fakro web site was right. Fakro should fix this. The problem is how to fix the box to the rough opening. Also it is not necessary to remove the temporary support battens as soon as suggested. Rated 5 out of 5 by Carunchie from Worth the investment Finally, I have a way to get into the attic without trying to squeeze through the small hole in my daughter's closet. We are doing a home renovation and set the stairs up in the laundry room. For the amount we are spending for this renovation, this is one of the best investments I've made. I have a bungalow and these stairs give me an easy way to get in and out of the attic to get all the wiring (lights, electrical, network, telephone, tv) sorted out. The attic does get hot during the day so I can easily go down cool off and go back in. It's good being able to take the time I need to get the wiring done properly. Thinking about getting a second hand rail but haven't needed it so far. My joist spacing in my older home is 21.5&quot; OC so that the spacing between joists is 19.5&quot;. This is narrower than the 22.5&quot; width of this unit. Is it possible to install this ladder but without its surrounding box so as to fit in the narrower space?